1. Have a blog of their own. 2. Contribute guest posts for 6 months. 3. Post 1 or 2 times a month on Oh So Pretty. There will be a schedule and your dates will be communicated to you in advance. 4. Have aesthetically pleasing pictures and posts. 5. Credit all images that are not your own. 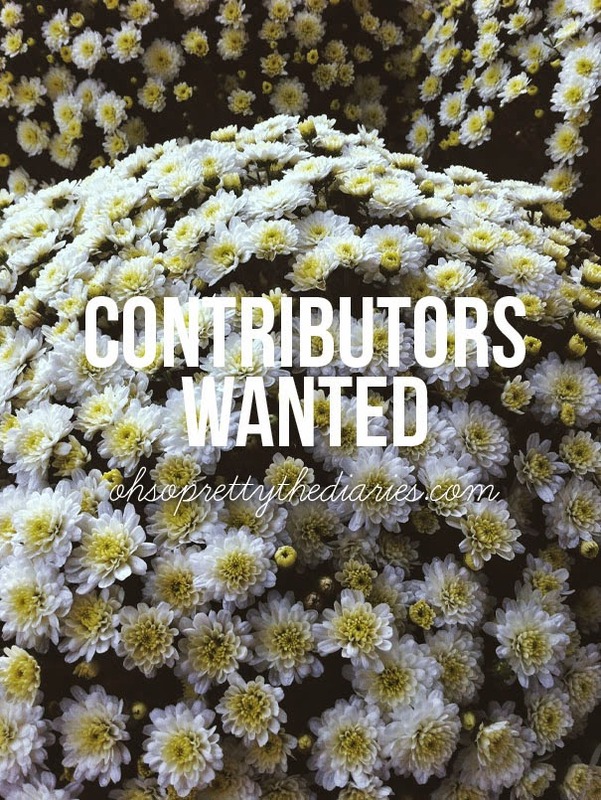 Contributors will not be paid but will have a bio (and link to your blog) under a "Contributors" section on Oh So Pretty. You cannot post your contributor posts on your blog but, each of your posts will be credited to you, giving your blog more exposure. We are looking for bloggers whose style is similar to the style of our blog. We want bloggers who can take a good photo and keep the viewer's attention throughout their post. If you are interested, send us an e-mail at ohsoprettytheemail@gmail.com. Put "Contributors: Your Blog Name" in the subject. Include a link to your blog and what area you are interested in contributing to. We will try to respond to everyone when the final decision is made. We look forward to hearing from you, good luck! Came across this and was wondering if you had found contributors.